It's taken a few generations, but just a few. "Keeping up with the Joneses" meant that in the post-war US, people generally looked at their neighbors to measure whether or not they were attaining a level of tangible consumer success they should be satisfied with. One generation removed from that, aspirational thinking started to erode the American psyche, as more workers looked at their boss than their coworkers when appraising what they "should" have. Now? Totally unglued. Celebrities are the standard. Consume, conspicuously, at all costs. From the Oval Office all the way down to the streets, it's a Keynesian dream state: borrow, spend, then borrow and spend some more, because if you dare slow down, the economic jalopy will come to a sputtering halt. As wage growth deteriorated, seemingly our ability to adjust to the adverse structural condition did, too. After all, those ethereal wage increases were “right around the corner,” until we ran out of corners but decided we were still entitled to maintain a standard of living through credit. Tough decisions needed to be made, especially by Baby Boomers in the early 80s. If they were made, they weren’t passed down effectively. 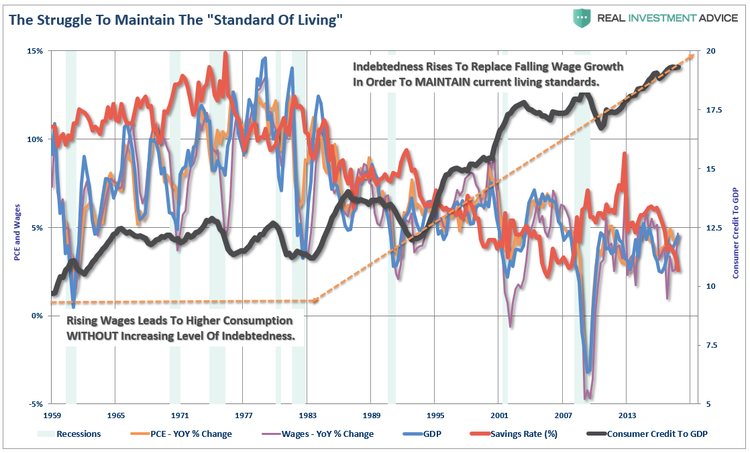 There are pervasive macro-economic charts created by the Fed, posted on their regional websites and plastered all over social media which display how Americans carry less debt than they did a decade ago; how wages are beginning to bust out of a long-term malaise. I’m happy about that. The micro story differs, however as income growth for the bottom 80% of Americans has been left in the dust. The top 20% however, are thriving. Unfortunately, it’s the masses who still need to make massive adjustments to bolster savings.